I was just talking to someone about this the other night and I know I touched on it in a post the other day. But, as fate would have it, it was shoved in my face yet again today and I feel the need to expound upon it. Since switching to Paleo, one thing I have found is that I am no longer consumed with the thought of food. When I counted calories or points or whatever, it seems that food was all I ever thought about. I would literally be eating one meal and thinking about the next. I could not go very long without food because my blood sugar would crash and I would become a raging maniac. It was sad. Since starting Paleo, I've discovered a whole new way to eat. I no longer think of food constantly. I no longer need to have food at certain intervals or risk becoming Mr. Hyde, in fact I have forgotten to eat meals and lived to tell the tale. I don't worry about eating before a workout because, even if a little hungry, I know I have fuel for the workout and won't die. Also, because with paleo I've switched to a fat metabolism and not a carb metabolism, I can do a really brutal workout and not suffer because of lack of energy. Your body can only hold a certain amount of carbs, but it can hold a whole lot of fat, therefore if you are burning fat for fuel you can last a whole lot longer than someone burning carbs. The only thing I have to worry about is not eating too close to a workout because then I will throw up. There have been days where I have gone to a WOD at 8 am, come home, and not eaten until noon. When your body has it's own fuel supply you just don't need to eat as much. At this point, I do not count anything. Not calories, protein, fat, carbs, nothing. I am developing intuitive eating. I eat when I'm hungry and stop when I'm satisfied. Many times that is way before I am full. I like the way it makes me feel and I like the way it makes my body feel. I no longer get those mid-afternoon energy slumps. Sure, I get a little tired after work, but it's super easy to shake it off now. I'm also feeling awesome in my workouts. I'm killing the WODs and PR'ing my lifts, it's fabulous. 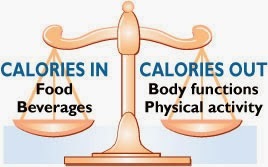 Which all leads me to my opening statement, it is not all about calories. It is about what kind of food you put into your body. Good food nourishes your body and provides benefits far beyond what calorie counting does. If you want to put processed food in your body, you can go ahead and spend your day justifying to yourself and everyone else that you eat healthy. You probably spend a considerable amount of mental time on food. I'm over that and it feels good to feel free of that. It also feels really good to lose those feelings of guilt that came with eating the old way. Now, if I chose to have something that is not paleo, it is a conscious decision and not something I regret later. Oh right, I no longer eat mindlessly either. When food enters my mouth, I am always very aware of it. Once in a great while I will mindlessly stick something in my mouth and my immediate reaction is always to spit it out because I wasn't thinking about it. I like that reaction.